Performance Lab has been using biometric data to coach and analyze the performance of tens of thousands of athletes over the last 25 years. 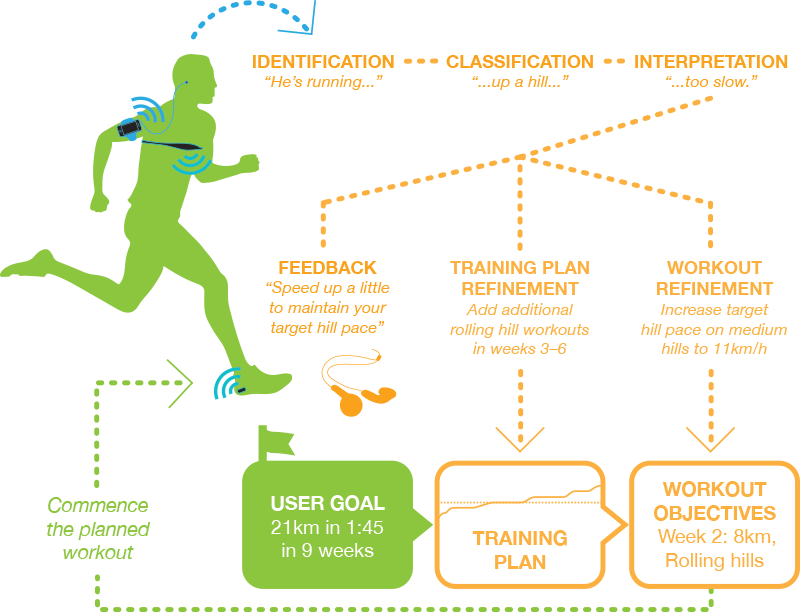 Our current artificial intelligence research program seeks to continuously improve our delivery of this coaching and analysis to the general population via mass market wearable technology and our ARDA software development kit. However, biometric and environmental sensor inputs always come with accuracy and reliability challenges. We use machine learning to ensure that our algorithms are as resilient as possible to rogue data, so that our coaching advice is relevant and trustworthy. Performance Lab has built a deep understanding of the principles of periodzsed training, training load and recovery, and have baked these into ARDA’s programs and live coaching experience. It is important to recognize and respond to the complexities of athlete’s daily lives, whether they are competitive or simply trying to fit exercise into a busy calendar. Our training programs can adapt to people’s changing schedules, tune intensity based on lifestyle inputs, and adjust in response to measured improvement. We are keen to work with collaborators who share a commitment to creating personalized exercise experiences for their customers. Research is being conducted on the application of physiological measurement for first responders, emergency services and, in particular, military training and combat environments. Commanding Officers with access to accurate fatigue and health measures can use these to make key tactical decisions about a unit’s actions. As with individual performance, data gathered from training exercises can be used to make better decisions around areas of physiological weakness and adjust training schemes accordingly. We are currently extending the ARDA software development kit to encompass activities beyond the initial core activities of walking, running, and cycling. Swimming falls out naturally, as cyclical limb movement is central to this activity, and we have already dealt with the concepts of drift and momentum in developing our algorithms for cycling. The same will be true for other cyclical water sports like rowing and kayaking, which are not currently on our road map. Performance Lab, with its history of triathlon, also has significant intellectual property in the coaching of swimming. Given the challenges of gathering biometrics in the water, the next phase of this research will be carried out in partnership with a device vendor. Our adaptive planning modules are also directly transferable to weight training. Our approach to programming for running and cycling follows the same periodization models that are optimal for strength training. We will substitute hypertrophy-based training for the endurance phase of a running/cycling program and are introducing peaking-based training into the specifics phase – the strength phase will remain the same. In the early days of sports performance analysis, teams focused on using game statistics as performance indicators. Data would typically be gathered by the team statistician on the sidelines, looking at points scored, assists, rebounds and fouls. Over time, technology allowed this process to become more automated and accurate, with coaches, fans and players now being able to look at pitching speeds and yards gained in real time. Top teams today are beginning to use physiological data in their training as well. The trouble with current biometric approaches is the tendency to focus on rudimentary measurements, such as heart rates and speed zones. Performance Lab’s work brings in new physiological measures from our individual performance research, such as acceleration and power generation, that are more accurate representations of performance and effort. With improved measurements, coaches can use this analysis to detect and distinguish between overtraining, detraining, lack of fitness, performance improvement and fatigue. These physiological factors can then be tightly integrated with the unique regimes of coaches, allowing them to make effective decisions about current and future workout plans in real-time. Working with in-game movement, previously unrealised links between team form (the relative positions of players on the field or court), physiological performance, and game outcomes become clearer. This kind of tactical analysis can then be used to identify and counteract team performance issues faster and more often. Coaches can now take immediate actions to improve team composition, as well as adjust future training plans. When combined with fatigue metrics, coaches will have a strategic and tactical arsenal capable of making a serious impact with team outcomes. The technology that was developed for performance athletes is very transferable to individuals training for weight loss, health, or general well being. Better measurement and integration with environmental data allows for the generation of real-time advice to help keep people in their optimal training zones, whatever their health goals might be. From experience, people’s gut instincts as to how they should train are generally not suitable for planning adequate training programs. This leads to fatigue and poor outcomes, and often causes reduced compliance with exercise regimes. By using real-time analysis to adapt their training programs, and by integrating automated virtual coaching, increased compliance, enjoyment, and most importantly, improved results for users can be achieved. Gathering physiological data from training can also act as an early warning system for health, helping to identify both acute and chronic cardiovascular issues for the user. Advanced schedule management and calendar integration. When it comes to training athletes, Jon is the definition of the word guru. A world-renowned training strategist, he specialises in program design and planning for high-performance athletes. He has over 20 years of experience in helping top athletes achieve the impossible. An experienced sportsman himself, Jon is a former national rowing champion and Ironman triathlete, and has represented New Zealand at two World Ironman Championships. A world leader in performance education, Jon has authored 9 books on sports performance and training, including The Complete Guide to Endurance Training and the bestselling Power to Perform, both of which are used as university texts. Jon’s most recent book Beginner’s Half Marathon Trainer has just been released in the USA. Jon conducts seminars worldwide, and used to co-host “The High Performance Hour” on Radio Sport and 1ZB, where he discussed high performance strategy with New Zealand’s most successful athletes. Since 1993 Jon has run Performance Lab, an organisation dedicated to helping endurance athletes achieve peak performance. He has been instrumental in the success of many athletes in New Zealand and worldwide, working with the All Blacks, The Blues (Auckland’s rugby team), America’s Cup yacht crews, New Zealand cricket teams, Olympic Yachting competitors, and members of the Whitbread Round the World Yacht Race. Jon also uses his expertise with world-leading athletes to help beginners. Jon and the team at Performance Lab constructed a program to help over 500 casual sportspeople and sedentary individuals train for a half marathon, a first for most of the participants. A full 90% of the participants reached the start line … and every one of them finished.